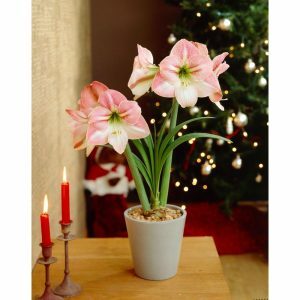 Amaryllis Christmas gifts are the perfect gift. Add bold color to any home with Amaryllis flowers. They are available in many beautiful Christmas colors. They will brighten any room. 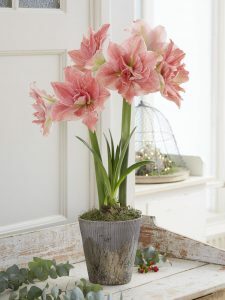 Amaryllis adds instant charm to your home with little effort. An easy to grow indoor plant. 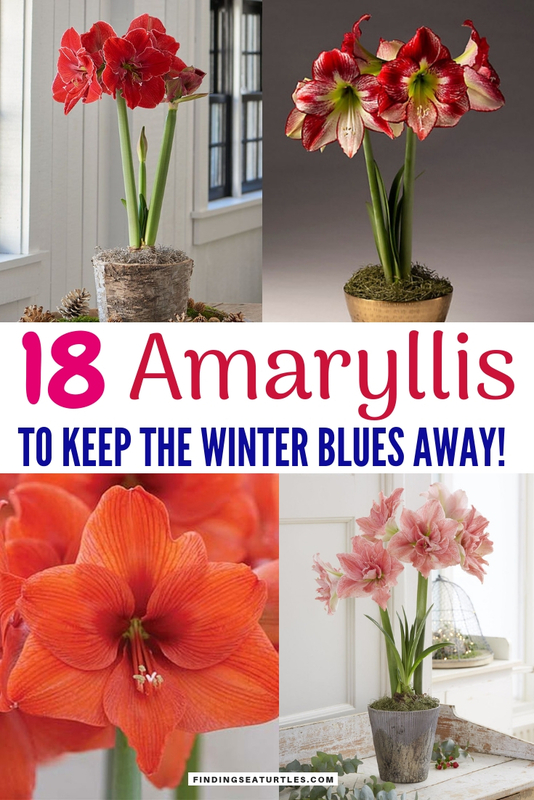 The Amaryllis plant will light up any Winter day. Bold colors that can make everything merry and bright! Indoor gardening that is easy to maintain. 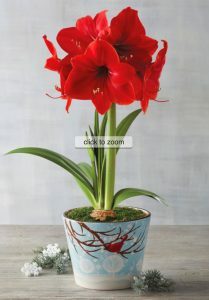 Take a look at these bold and beautiful Amaryllis Christmas gifts. Perfect for gardeners or anyone on your shopping list. Be sure to tell us what you think in the comments below. For glorious deep red blossoms, choose Red Lion Amaryllis. The Red Lion Amaryllis blooms in four to six weeks. Delivered with the Red Lion, is a snowy blue container with a bright red cardinal perched on a branch. 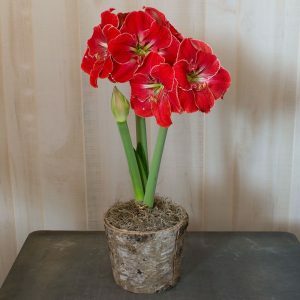 Bring some Winter cheer to your doorstep with the Red Lion amaryllis. 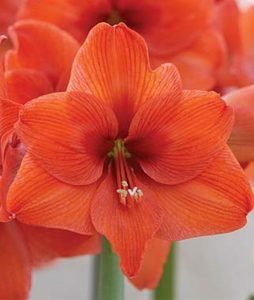 Big bold color is what you can expect with the Naranja Amaryllis. Bring a modern look to your home. Festive colorful Naranja is a crowd pleaser. Naranja Amaryllis has orange trumpet flowers with deeper orange shades in the center. Plant indoors in a full Sun to part Sun and shade area. Reaches between 20 to 24 inches tall. 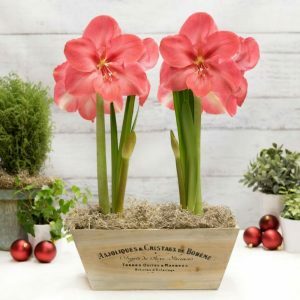 Lovely Amaryllis Christmas gifts for garden loving family and friends. With its sweet apricot-pink petals, the Rosalie Amaryllis is pure elegance. Glowing apricot-pink blossoms with cool green centers are impressive during the Christmas season. The Rosalie Amaryllis produces 4 to 5 giant blossoms. Plant in full Sun to part Sun and shade. Topping out at 20 to 24 inches tall. A Christmas favorite soon, if not already! Luscious double blooms in candy pink. The Sweet Nymph Potted Amaryllis is showy. With a textured mercury glass-like cachepot, the Sweet Nymph makes a big impact. Vibrant and luscious candy pink blooms look magnificent in any home. Provide a bit of Sun and regular watering for this easy to grow amaryllis. 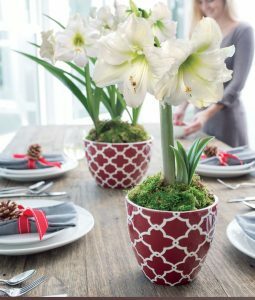 Classic Christmas red and white colors is what the Tres Chic Potted Amaryllis delivers! Spectacular deep red flowers with white stars and chartreuse centers. The Tres Chic arrives in a vintage inspired mercury glass cachepot. Add some Sun and light watering. 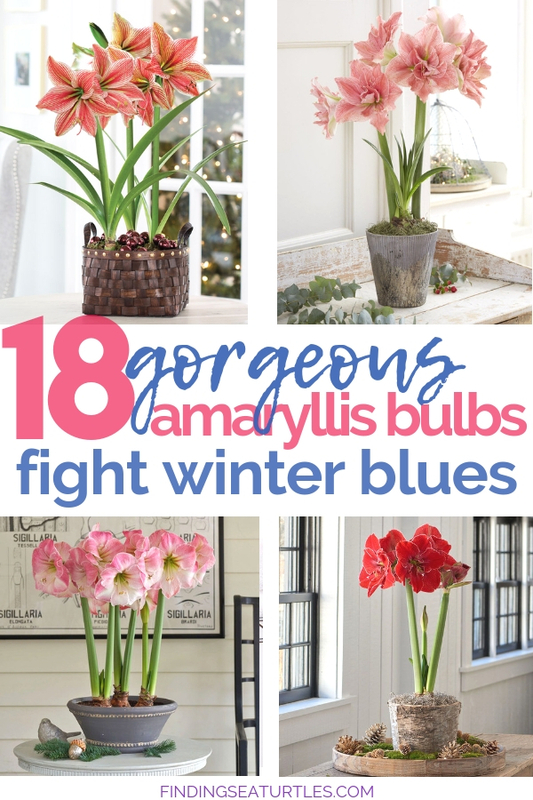 Then watch your bulb transform into a Tres Chic Amaryllis! 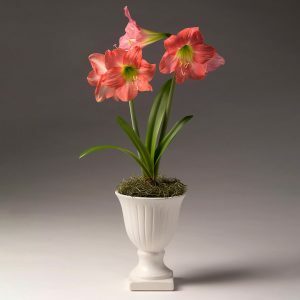 A rich, candy pink amaryllis with darker veins and brushstrokes is what you’ll love about the Caprice. Blooms of broad petals with vivid lime-green centers are the colors of the Amaryllis Caprice. A stunning Wrenthorpe Pancheon handmade bowl is a classic. A houseplant, the Caprice requires a good light source. Blooms from January to February. Topping out at 18 inches tall. A dazzling display! A reverse picotee, the Amaryllis Magical Touch has rich red petals finely edged in white. Broad petals are traced with deep red veins and ruffled margins. Blooms in full Sun during January and February. Standing tall between 18 to 24 inches. Arrives in a beautiful birch basket, a woodland lovers delight! 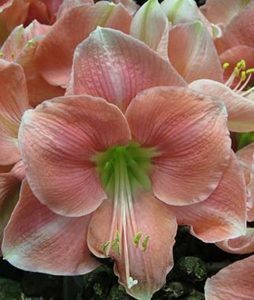 Flamenco Queen Amaryllis has feathered, streaked blooms. Blooms are white and cherry red with green centers. A festive gold bowl is included with the Flamenco Queen. A pretty indoor houseplant that likes direct sunlight. Reaches 18 to 20 inches tall. For festive color to your holiday home, grow and display the Flamenco Queen! In a mini urn pot, the Belladonna Amaryllis has fragrant pink blossoms. An indoor houseplant that adds much needed Winter joy to any home. The Belladonna Amaryllis is an indoor plant that likes direct sunlight. A beautiful coral and rose-pink Amaryllis. The Amaryllis Lagoon arrives with a Wood Crate for planting. Enormous blooms, the Lagoon tops out at 20 inches tall. Grow indoors in a full Sun to part Sun and shade location. A bold red, the Amaryllis Magnum arrives with a Silver Ceramic Pot. The Magnum has velvety red 9 inch wide blooms. Grows 20 inches tall. An indoor plant that likes full Sun to part Sun and shade location. 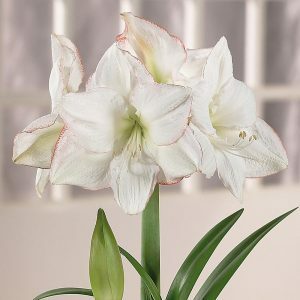 Double pink and white blooms is what the Apple Blossom Amaryllis delivers. A lovely amaryllis arrives with a white ceramic pot. Typically blooms in 6 to 8 weeks after planting. Six to eight inch trumpet shaped fragrant flowers appear. The large pristine white flowers have soft pink feathering on tall stems. The Apple Blossom grows 18 to 20 inches tall. Place indoors in a Sunny spot. Perfect for the holiday season! Reminiscent of apple orchard flowers seen in the Spring season. Popular for its cheerful holiday color, the Amaryllis Picotee is delightful. Grows 24 inches tall. Picotee is about 12 inches wide. 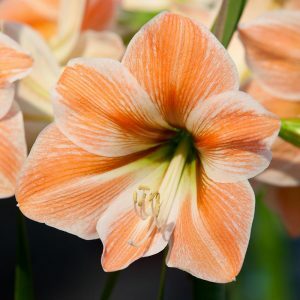 A unique apricot color with green throat, the Amaryllis Apricot Parfait is stunning. An indoor plant, the Apricot Parfait has a striking apricot blush color with darker colored veins. Tops out at 24 inches tall. Likes a part Sun and part shade location. Grows between 18 to 24 inches tall. The Gifts of Gladness Amaryllis has trumpet-shaped blooms. Gifts of Gladness has red, pink, pale green, and white pin stripes. A gold-studded chocolate brown container is included. 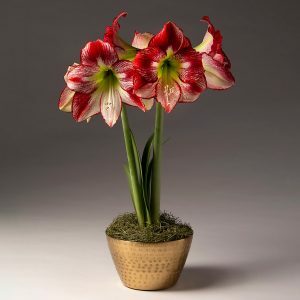 A beautiful holiday amaryllis Christmas gifts that is sure to please all! Striking blooms appear on the Christmas Love Amaryllis. 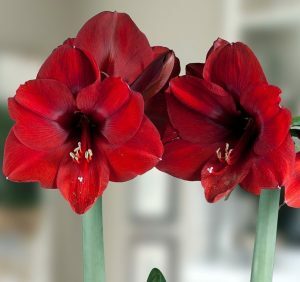 Wine red and ivory brush-stroke blooms make Christmas Love a charming amaryllis. 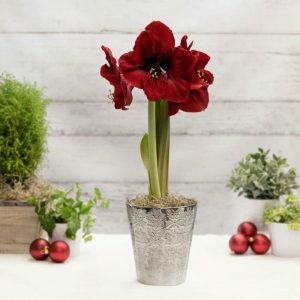 The Christmas Love Amaryllis comes with a platinum harlequin ceramic cachepot. Grows between 18 to 24 inches tall. Merry & Bright Amaryllis has beautiful snow white blooms. Grows 18 to 24 inches tall. Included along with the Merry & Bright Amaryllis is an embossed ceramic deep red planter with geometric print. 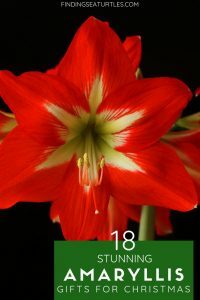 A show stealer, the Merry & Bright Amaryllis will become a much prized Christmas plant. Tops out at 20 to 24 inches tall. The Olaf Deep Red Giant Amaryllis is a real beauty. Long lasting blooms that are 8 inches in diameter. A spectacular amaryllis. Easy to grow indoors. Bring festive holiday colors into your home decor with the Olaf Deep Red. Stunning color! 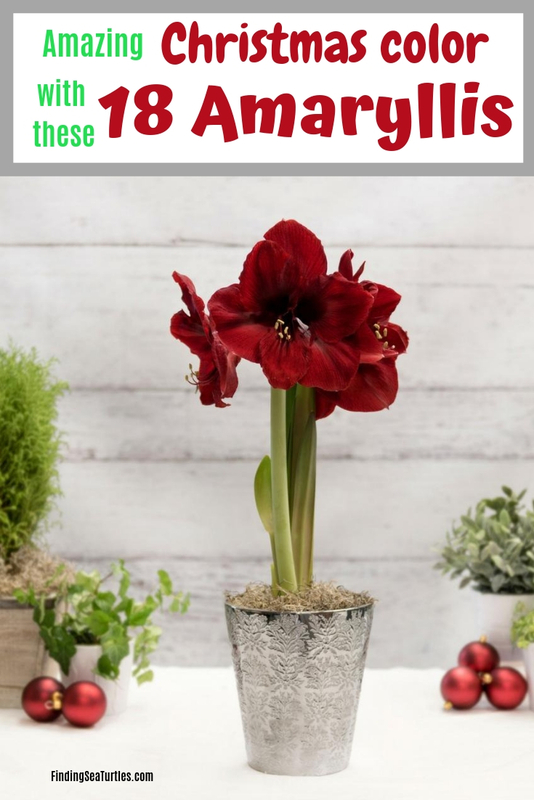 These are 18 spectacular Amaryllis Christmas gifts for your family and friends. 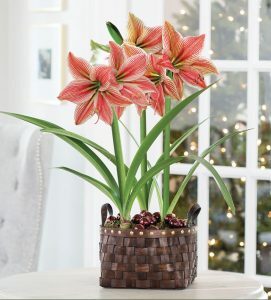 Celebrate the Christmas holidays with a classic longstanding holiday favorite, the Amaryllis. Perfect for growing with young children or your parents. Or giving as Christmas gifts. 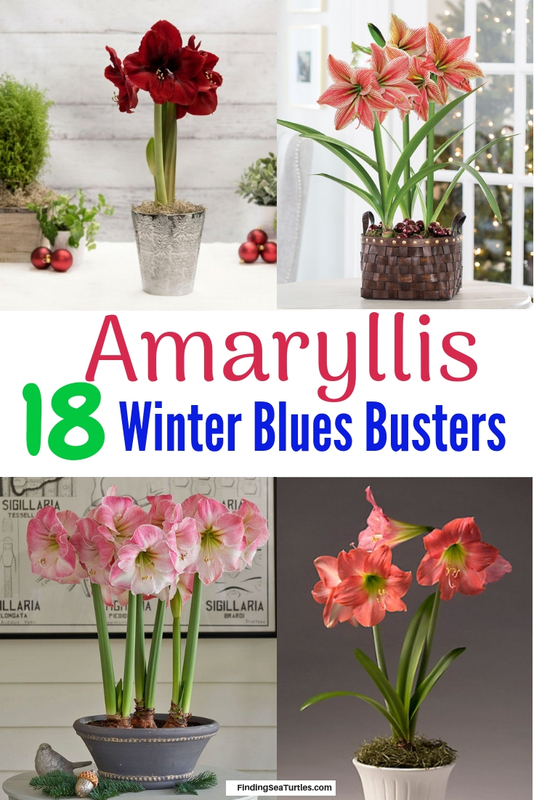 Amaryllis are so versatile. They can adorn a dinner table, provide elegance on a mantle or used in a Christmas vignette. 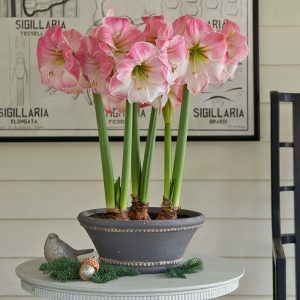 Amaryllis adds instant cheer to your home throughout the Holidays. A great gift for plant lovers and home decor lovers. A real show stealer! 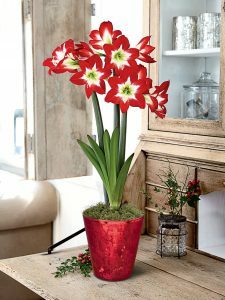 If you have a favorite Christmas amaryllis let us know. 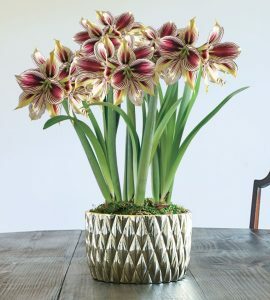 Consider sharing your favorite amaryllis with us. And if you try any of these Amaryllis Christmas gifts, let us know how you make out in the comments below! Thank you for stopping by.